Buyers hit Dubai’s beachfront for a touch of luxury living. The action is heating up all across Dubai’s beachfront locations. Not just from those wanting to catch a bit of sun, but investors who feel the combination of a property by the water anywhere in Dubai is the right way to stay ahead of market circumstances. The latest numbers for freehold transactions in Dubai bear this out — a Bulgari home on Jumeira Bay fetched Dh60 million to be the priciest deal in the first three months. In fact, all of the Top 5 deals involved a property by the water, including a unit at the under-construction 1/JBR, which went for Dh12.97 million, according to data from the brokerage firm Luxhabitat. For Dubai Properties, the stakes are indeed sky-high for the 1/JBR. 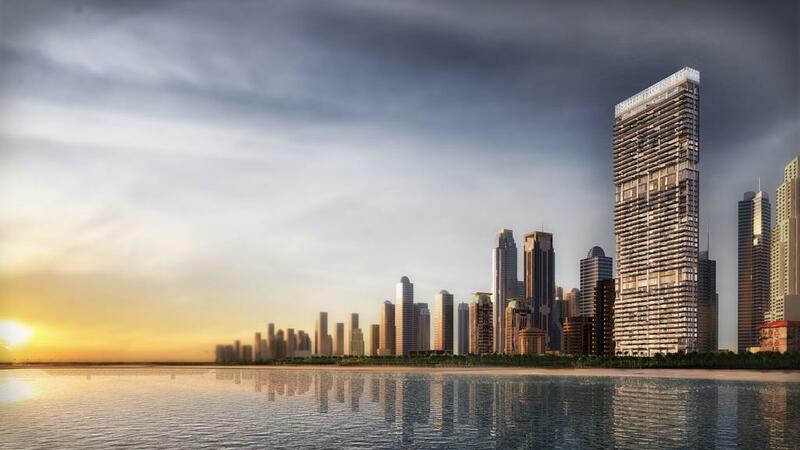 Billed as the master-developer’s “flagship” development, the 239-metre, 46-storey is scheduled for a Q4-19 handover. There are 163 units in various configurations, including five-bedroom penthouses. On the construction side, a floor is now being added every week. The core walls of the structure have reached the 14th floor. The gross floor area will eventually come to 45,000 square metres, while the built-up will be 74,000 square metres. The top 15 floors feature private lobbies and semi-private ones for the first 30 floors. All apartments from the 31st floor and above will offer residents access to private elevators (and operated using personalised digital key cards). We’ve created a brand for 1/JBR that sets it apart from numerous other current projects,” said Al Kindi. “The communication campaign immediately made the project distinct creating significant interest. Added to that was the buzz surrounding some of the units that we have sold, which commanded a premium. We can confirm that the most expensive unit sold to date — in 2016 by Gulf Sotheby’s — (was) at a value of Dh29 million. “We are working off of a masterplan that is evolving to suit market needs; we will release a majority of the inventory in a phased manner. As of now, we have sold 70 per cent of the project at a value of almost Dh1 billion. All across Dubai’s waterfront, new projects are trying to catch the investor’s eye. Apart from the Jumeirah shorelines, the Canal extension and the Creek are the other obvious location choices for anyone wishing for a waterside address. (One development, Majid Al Futtaim Properties is even creating a beach-side environment even within the city, at its Dh14 billion “Tilal Al Ghaf” community in Dubailand. )“Recently, investors have taken interest in projects like Dubai Properties’ Riverside, Emaar’s Creek Harbour and more recently the Emaar Beachfront on Dubai Harbour,” said Andrew Cleator, Luxury Sales Director at Luxhabitat. “In addition, end-user interest has picked up on projects like 1/JBR — where we sold three units this year — and the Alef Residences on the Palm. “The large two-beds at 1/JBR range from Dh4.94 million to Dh6.15 million, and three-beds from Dh7.1 million to Dh8.95 million, and the one remaining penthouse at Dh33.71 million. All are direct from the developer. And at some point in the near future, they will have another new sea-front tower to choose from — the residences at the Palm360 on the Palm and to be managed by Raffles. All across Dubai’s waterfront, new projects are trying to catch the investor’s eye, with the ‘Top 5’ deals in the first quarter involving properties by the water. Dubai Properties has been working with Dubai Municipality and Roads and Transport Authority (RTA) on a dedicated roundabout to ease access to the 1/JBR. Also, as part of the infrastructure expansion in the area, a new exit along Mamsha Street will enable vehicles to get to and from the site without having to use King Salman Bin Abdul Aziz Al Saud Street along Jumeirah Beach Residence.